The safest, fastest and most economical way. Integrated shipping solutions LCL, FCL, using the most reliable shipping lines. Air Transport to any country in the world with the world's largest airline. We offer comprehensive rail transport solutions with firm partnerships with the most reliable rail lines. 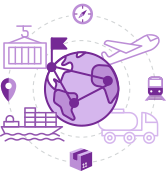 Logistics Services offering Effective Solutions (3PL Solutions) that cover all the needs of the Supply Chain. Storage and distribution of Dry and Controlled Temperature Cargo. Storage of goods from Third Countries under the Bonded Warehousing procedure. Holder of the Authorised Economic Operator Certificate (AEOF) Customs Simplifications/Security and Safety. Haikalis Trans SA has various vehicle fleets on the move per week.